MARKHAM GLOBAL Australia are suppliers and application experts of the proven AQURON 7000 Concrete Protection Treatment to the Australian concrete and construction industry. With Australian projects performing in high temperatures and conditions of Queensland and Northern Territory, to the coastal structures in North Sales Wales, to the extremes of the Tasmanian mountains, AQURON 7000 concrete protection is a leading and economical solution for extending durability of Australia's concrete structures. AQURON 7000 Ultimate concrete protection is spray applied to concrete and deeply penetrates into concrete by unique catalyst forming molecular attraction. Once penetrated into concrete AQURON 7000 forms a hydrogel in the porosity of the concrete stopping all moisture migration. Internationally accepted logic confirms that "stopping moisture migration into and through concrete porosity halts all common causes of corrosion". AQURON 7000 Concrete Corrosion Protection stopping moisture migration internally in concrete eliminates and overcome risks of ALKALI REACTIVITY (AAR-ASR) and Delayed Ettringite Formation (DEF) in new and existing concrete. AQURON 7000 unique formulation includes a corrosion inhibitor that works to neutralize, or purge Contaminants from concrete, further protecting the concrete from corrosion. AQURON 7000 has long term and excellent performance on Australian concrete structures washed by seawater and coastal spray, or that have been attacked by salts, acids, effluents or corrosive gases. AQURON 7000 Concrete Protection and Chloride Reduction System for concrete is guaranteed to halt internal corrosion. AQURON 7000 Concrete Protection treatment is ideal for wharves, bridges, infrastructures in coastal Australian environments (internationally recognized as within 50km of coastline), and concrete structures exposed to the effects of carbonation such as Australian roads and motorway infrastructure. Why use AQURON 7000 Corrosion Protection to extend the life of YOUR concrete structure? 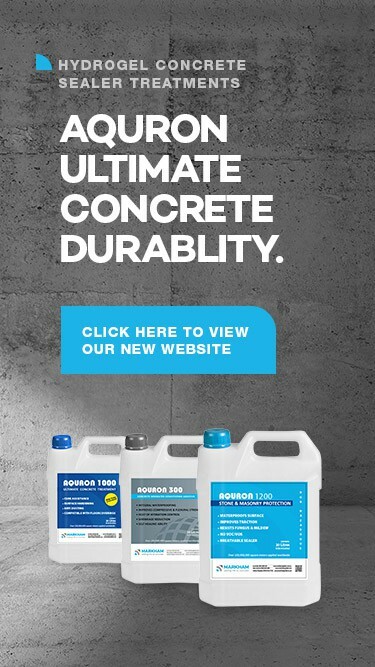 AQURON 7000 has performance proven of protecting concrete structures for over 25 years. AQURON 7000 is a proven long-term economic solution for protecting Australia's concrete structures from ongoing corrosion. AQURON 7000 is a more environmentally friendly option and user safe for protecting concrete structures compared to solvent based products for protection from corrosion of concrete structures. MARKHAM GLOBAL's focus is protection of overall concrete structures in combination with traditional Concrete Repair mortars, is the ULTIMATE solutions for extending service life of Australian concrete structures. AQURON 7000 Concrete Protection halts further corrosion in surrounding concrete, and reduces potential for concrete break-out along side concrete repair (i.e. Incipient Anode Formation). MARKHAM GLOBAL's Australian Team welcome opportunity to discuss how AQURON 7000 Corrosion Protection can make the difference for protecting your concrete structures. Download MARKHAM GLOBAL 2014 Overview.